London, United Kingdom: Weidenfeld & Nicolson, Limited, 1999. 909 pages, index, appendices, black & white photographs. 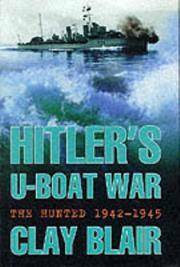 The second of two volumes on the Nazi U-boats during World War II covering the years 1942-1945. The struggle for supremacy of the seas has turned against the U-Boats as the Allies hunt them down. A fine copy in the jacket.. First Edition. Hard Cover. Fine/Fine. London: Weidenfeld & Nicolson. Hardcover. 0297840770 pp xxxi, 909. DJ shows slight signs of wear. . Fine. 1999. 1st Edition. Weidenfeld & Nicolson. Used - Good. Shows some signs of wear, and may have some markings on the inside. Weidenfeld & Nicolson. Used - Very Good. Great condition for a used book! Minimal wear.